I was driving down the freeway in Madison and smoke started coming out of my car. I pulled over and called my husband. I had to be towed to my Madison mechanic. He said my car had overheated. What can I do to prevent that in the future? Oh, sounds like a rough experience. Unfortunately overheating is the most common engine failure in Madison . It's also one of the easiest to prevent. 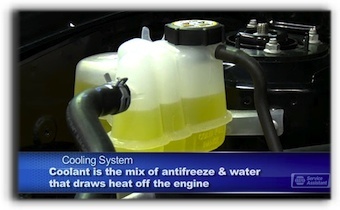 The basic idea is this: you need to keep enough coolant/antifreeze flowing through your vehicle engine to keep it cool. Problems come for Madison drivers when they develop leaks in their systems – like in the radiator or a hose – and the coolant leaks out. Sometimes the coolant gets so contaminated that it blocks up the radiator so the coolant can't get through. Enough of that and you end up broken down on the side of the road. Your owner's manual recommends a schedule for coolant replacement. That's because your coolant actually becomes corrosive over time and starts to eat away at the cooling system, causing leaks or blockages. New coolant stops that process. Ask your friendly and knowledgeable pros at Crestwood Auto Clinic about inspecting your vehicle cooling system for leaks, spongy hoses and other damage. If it's time to replace your coolant, hoses or other cooling system parts, have it done right away at Crestwood Auto Clinic in Madison. Prevention at Crestwood Auto Clinic is the key.